He has completed his MBBS from government medical college Thrissur , MD in internal medicine from Netaji Subash Chandra bose medical college Jabalpur & DM training in gastroenterology from prestigious Sanjay Gandhi post graduate institute of medical sciences Lucknow. He is also a certified gastroenterologist by diplomate national board in India. 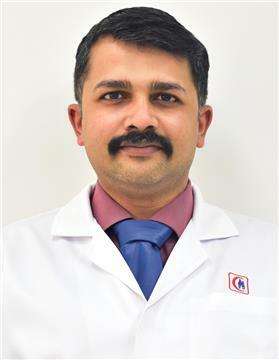 With more than 8 years of experience at various reputed organizations, he is an expert specialist in the fields of internal medicine and Gastroenterology. He also holds an academic history of Asst. Professor, Department of Gastroenterology, Amala institute of medical sciences . He has attended various conferences, international post graduate courses and presented many papers and publications at various levels. He is also a Consultant Gastroenterologist at Westfort group of Hospitals, Thrissur, Kerala.